These tablets can be used to remove chlorine from your water, to kill bacteria on brewing equipment, and to protect your beer by preventing unwanted foreign bacteria fermenting in your beer. So what is this, some kind of super pill? Campden tablets are basically potassium metabisulfite or sodium metabisulfite. When added to the beer or even cider or wine, they instantly react with the chlorine (or chloramine), removing it from the water solution. All this is done without adding any unwanted flavours to your water or beer. How many Campden tablets should I use? 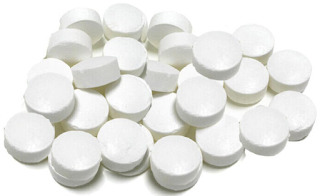 If removing chlorine from water, half a tablet to 5 or 6 gallons will break it down in less than 10 minutes. If stabilizing apple juice when making cider to kill of wild yeast, deploy one crushed tablet per gallon of juice. You should wait for approximately for 24 hours before you pitch your yeast. If trying to stave off an infection in cider or wine, then 1 or 2 smashed up tablets dissolved in your product, rack if you need. You will then probably want to bottle your cider asap and hope the tablets can overtake the infection. This trick may or may not work. Are Campden tablets safe to use? What about the release of sulphur dioxide? Yes, the tablets break down into very drinkable compounds - remember this product has been used for many years, if it did cause any harm, it wouldn't be such a successful product. You may have heard that sulphur dioxide is released into the water. This is very true, however, when it reacts with the chlorine and chloramine it quickly breaks down. By the time your beer is to be drunk, the concentration in terms of parts per million is massively diminished. So your beer is safe as houses to drink. Producers of cider know full well that a batch of juiced apples can easily succumb to acetobacter bacteria contamination which causes the classic turn-to-vinegar spoilage of the apples. Yeast is resistant to the tablets but the acetobacter is easily killed off, hence treatment with an agent like a Campden tablet is important in cider production. Why are campden tablets used with wine? In addition to preventing stray bacteria talking hold of a homemade wine, Campden tablets can also be utilised as an anti-oxidizing agent when transferring wine between containers. The sodium metabisulfite in the Campden tablets will trap oxygen that enters the wine, preventing it from doing any harm. Do Camden tablets halt fermentation? It is a fairly common misconception that Campden tablets can be used to halt the fermenting process in wine or beer before all the sugar is converted by the yeast, hence controlling the amount of residual sweetness in the final product. It is simply not true though. To truly completely stop fermentation, you'd need too many Campden tablets to do so, which would then actually make your produce undrinkable. Where do Campden tablets get their name from? The original solution was developed in the 1920s by the Fruit and Vegetable Preserving Research Station which came from the English town of 'Chipping Campden'. The Boots UK pharmacy chain then made the product popular when they developed it as a tablet. Do I have to use these tablets, are they necessary for brewing? No, the use of Campden tablets is totally your choice as a brewer. If you live in an area where the municipal water supply is not heavily dosed with chlorine, then you might not need to. Brewers in Havelock North, New Zealand will sure tell you how bad the chlorine is in the water after the local Council managed to poison so many residents, so in such regions, you would seriously want to consider using them. There are other means of removing chlorine and chloramine in the form of active carbon filters. In the context of a home or residence, these units are generally only good for producing tap water. If you need larger volumes of water for brewing with, a carbon filter will take a fair bit of time to filter your water. If you are using Campden tablets for sanitizing your brewing equipment or wooden barrels that you age your beer in, there are many other options out there, including sodium percarbonate (it's cheap as chips) or something more professional like Powdered Brewery Wash.
Fun fact: Campden tablets are also useful in decontamination and neutralization after exposure to tear gas!